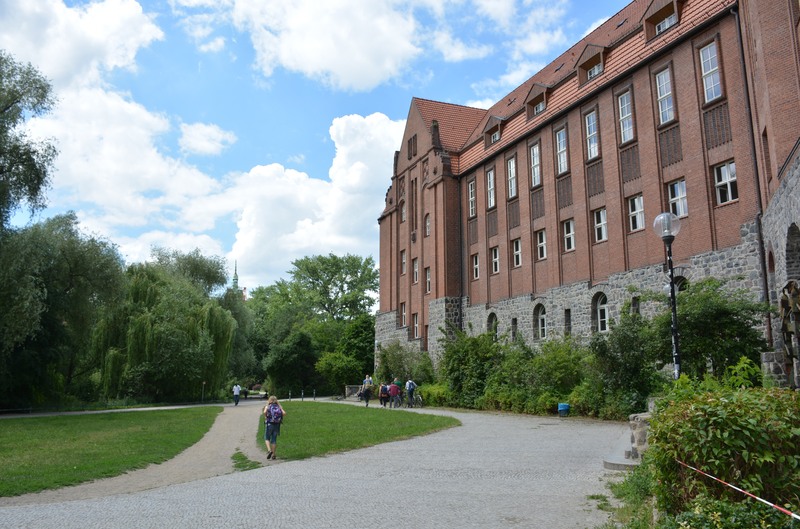 Following the success of the 2015 Historical Media Workshop, Facts & Files held another Transcription Workshop on 27 June 2016, again at the Primo Levi Gymnasium, in Berlin-Weißensee. 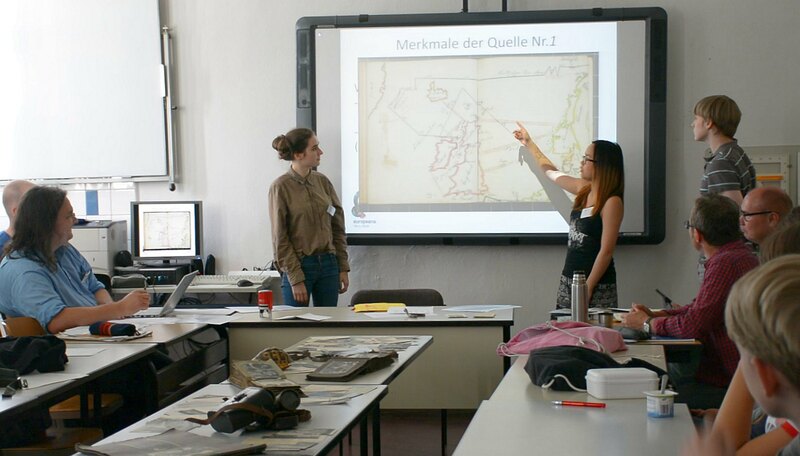 In celebration of the school’s Day of Social Sciences, students partaking in the workshop were given the first test run of the new transcription tool and website here at transcribathon.com. Participants were split into groups and each group worked together to transcribe an original, handwritten document from Europeana 1914-1918. 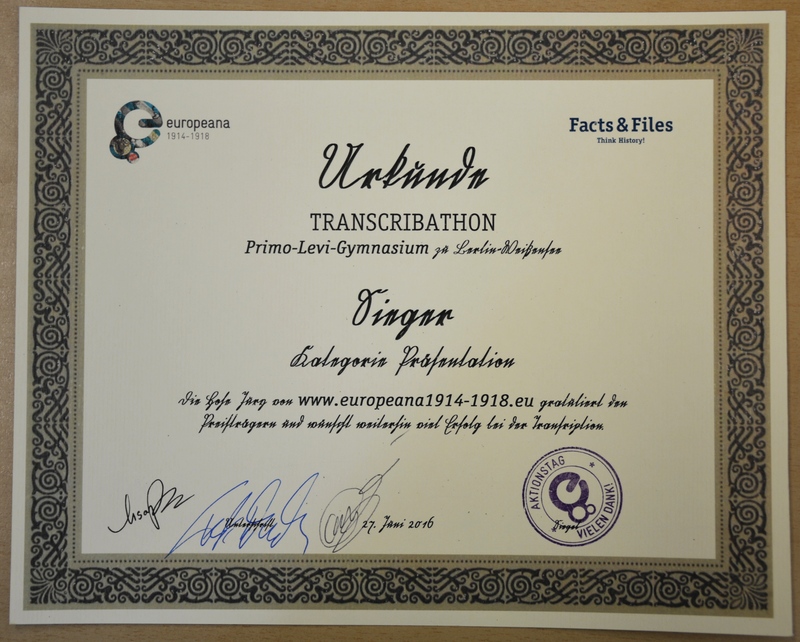 Winners of category Transcription went to Group 2, who worked on two of Toni Edelmeier’s school essays, and Group 3 won best Presentation for Fritz Apsel’s war diaries. We want to congratulate each student for their great work on the day and look forward to their involvement in our future projects. 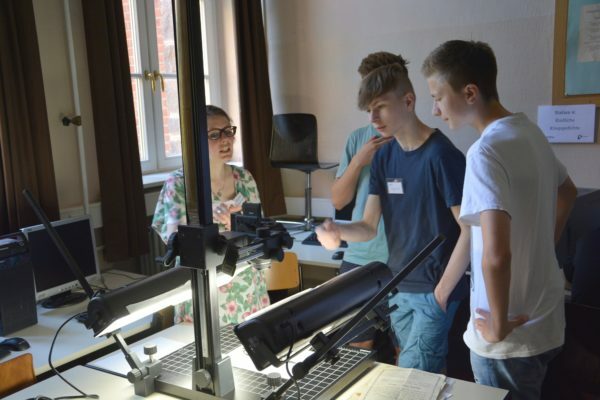 On 2 July 2015, as part of the Day of Social Sciences (Tag der Gesellschaftswissenschaften) in Germany, the private historical research institute, Facts & Files, organised a historical media workshop for interested students at the Primo Levi Gymnasium in Berlin. 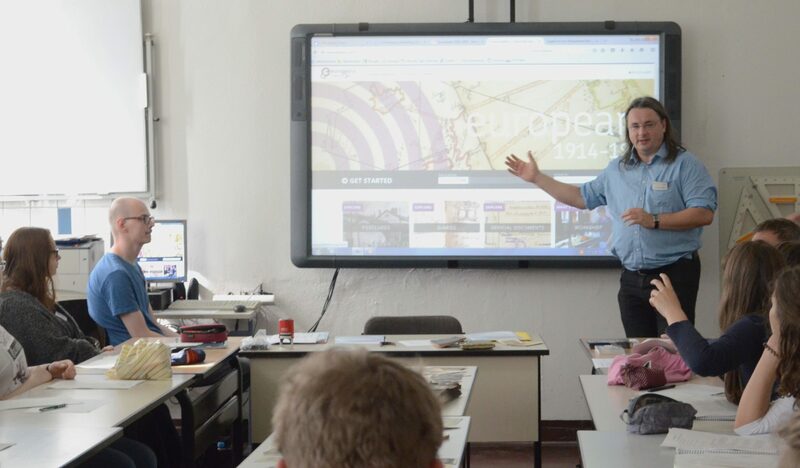 The workshop was aimed to teach students a variety of media skills through combining the use of modern technology with original historical documents. The idea was to raise awareness for the importance, as well as the difficulties, in handling original sources. 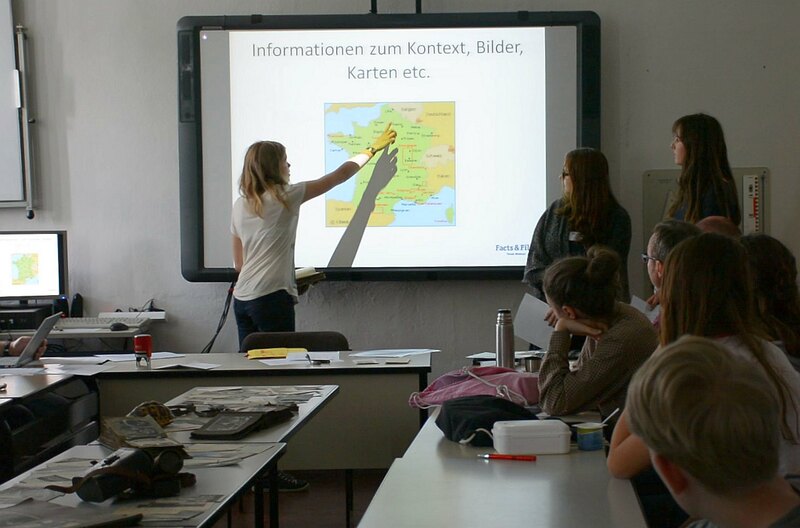 During the workshop, students experienced the complete process of working with historical media. 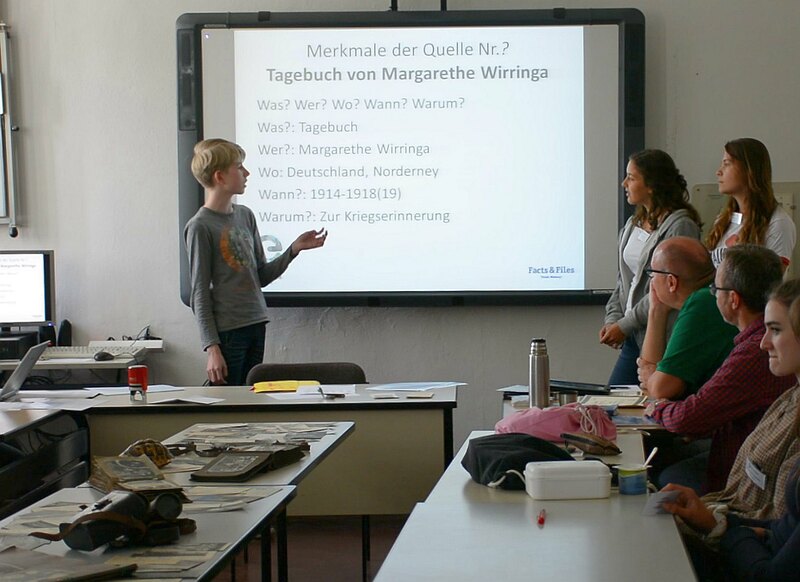 They were given the opportunity to research, digitise, transcribe and evaluate their sources. Original documents of the First World War, collected and digitised by Europeana 1914-1918, were provided as demonstration material. 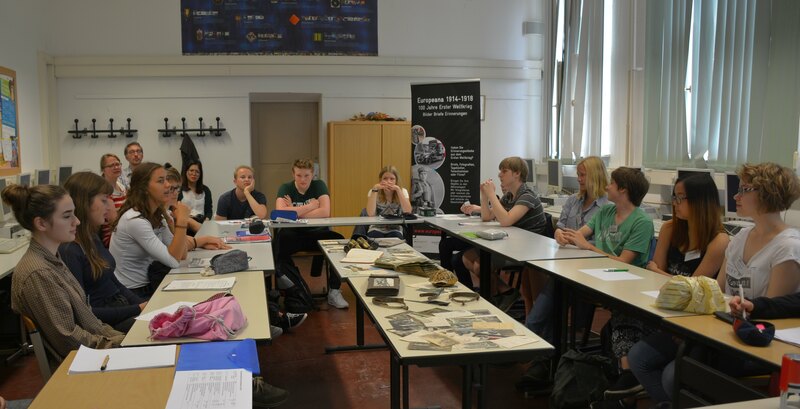 Students were also encouraged to enquire within their families to incorporate their own material of the war into the workshop. 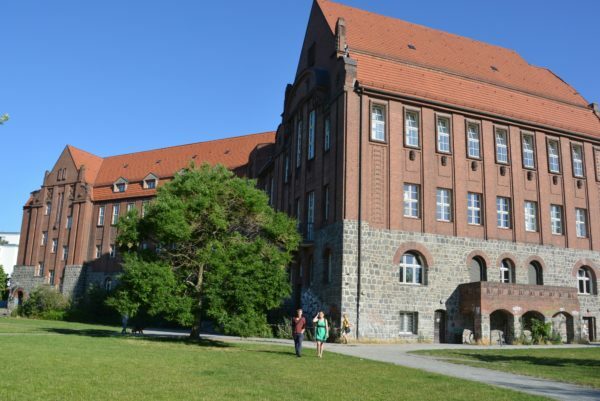 By examining individual testimonies and family documents, the students could begin to understand the often-abstract history of the First World War as a much more accessible and common experience. 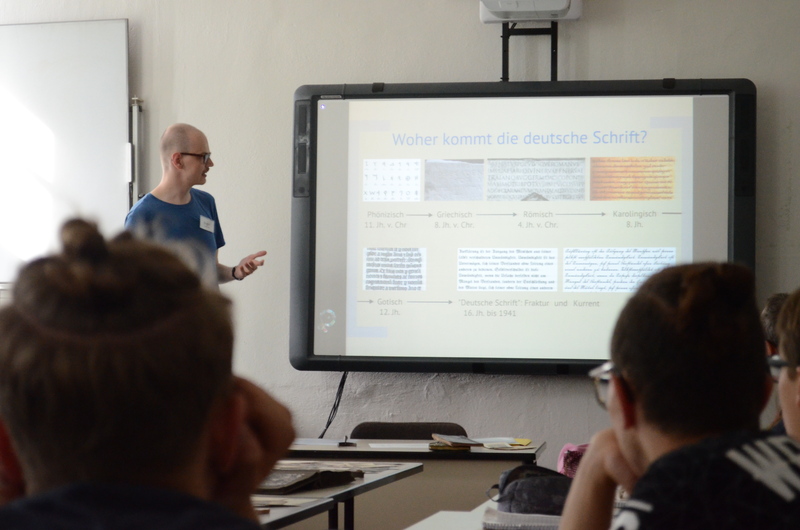 writing, and Sütterlin – the last widely used form of Kurrent, the students transcribed the documents online in small groups, working alternately on different texts. 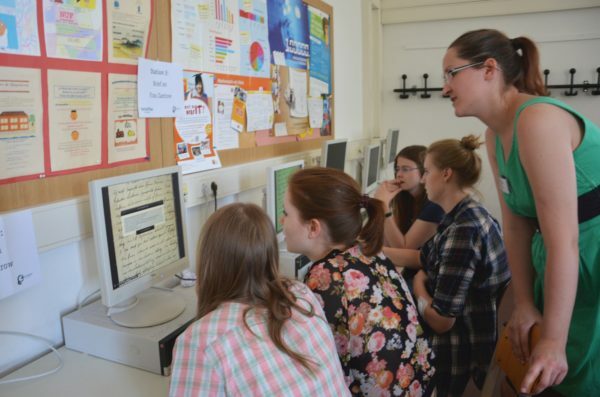 Students were then introduced to the technical work involved with digitising historical documents. 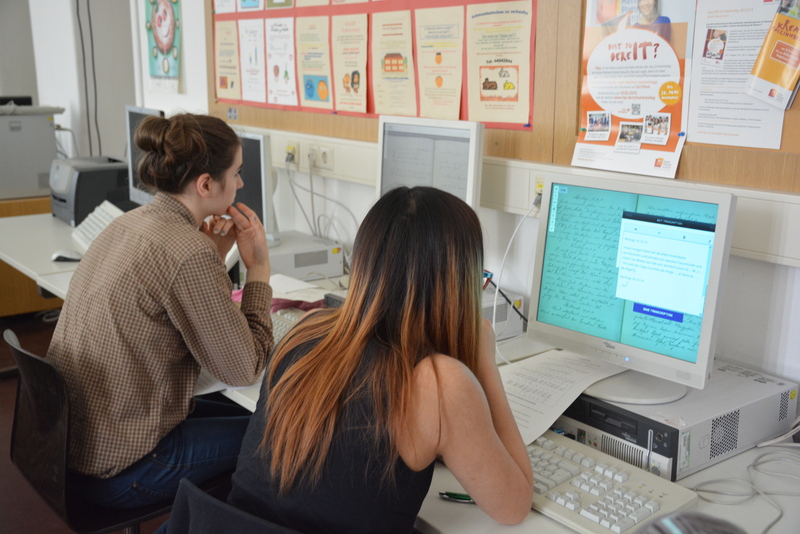 During the workshop, the students tested the online transcription tool, Europeana Transcribe. 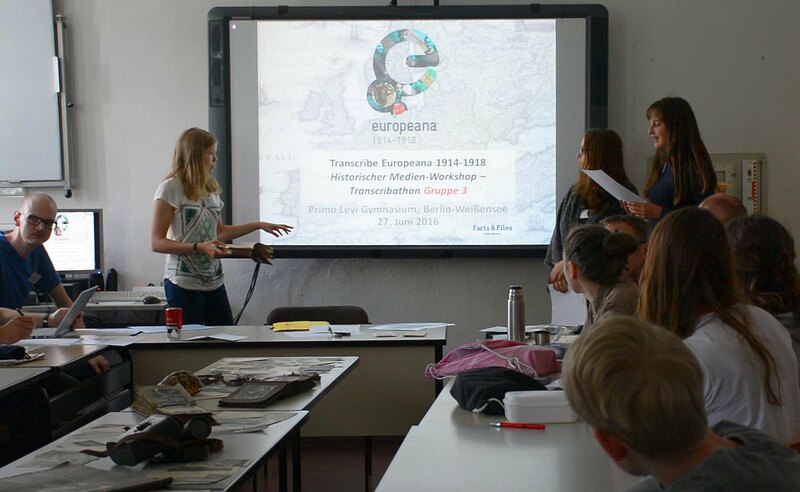 Developed by Facts & Files, and funded by the German Federal Commissioner for Culture and the Media, the Europeana Transcribe project aims to make transcriptions of Europeana1914-1918 documents through public crowdsourcing. This rests on the idea that historical documents can become more accessible and the quality of transcriptions are gradually improved as more people are involved. 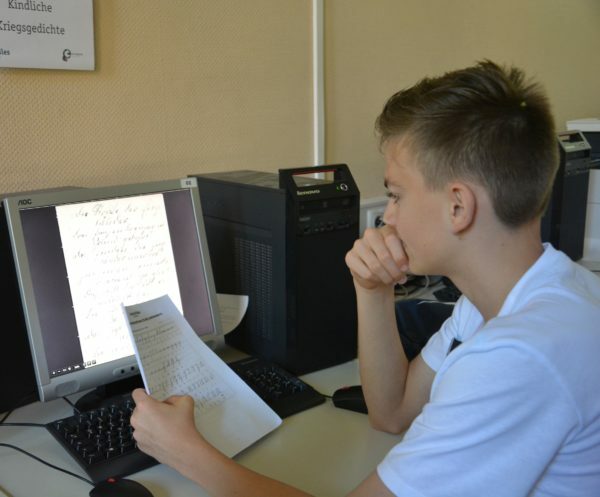 In the same manner, the workshop enabled the students to work together and improve not only their transcription and media capabilities, but also gain valuable teamwork skills. 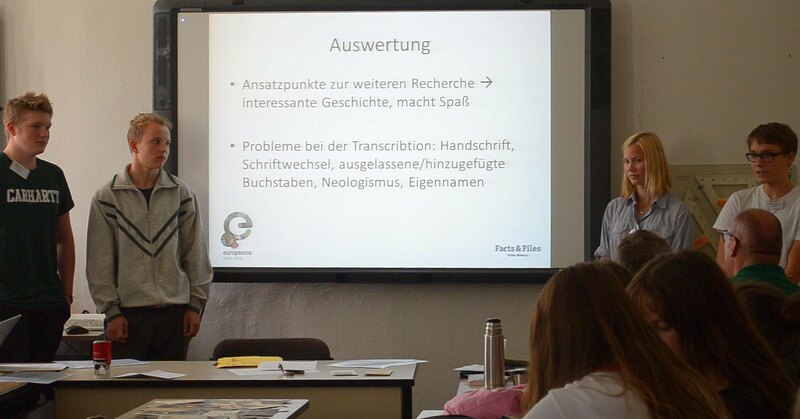 At the end of the workshop the students were asked to discuss the results and reflect on their personal experience of the transcription process. 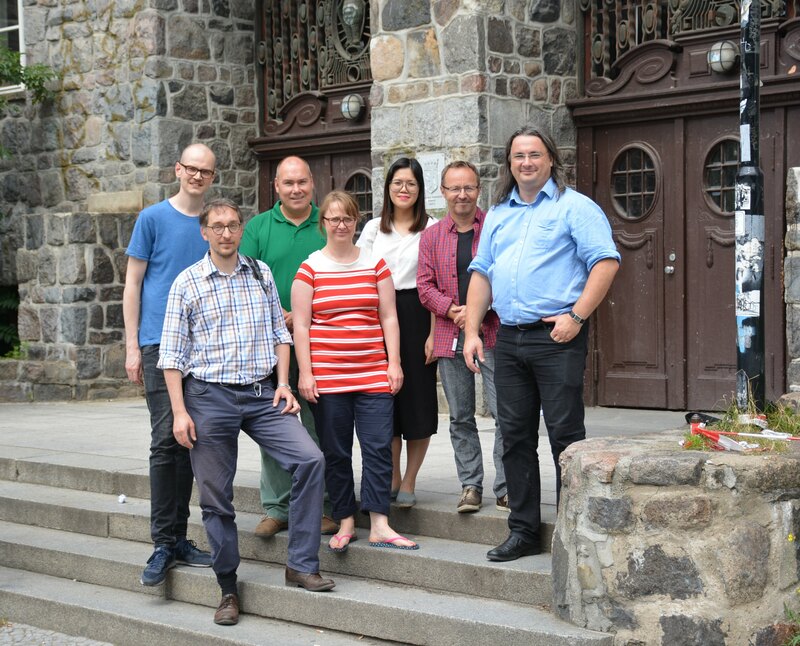 They were also encouraged to engage with further projects of Europeana 1914-1918.